We were sitting cross legged on the ground of a stone walkway overlooking the Western Wall plaza. Each of us had brought a large bottle of water that we sipped on frequently as we tried to squeeze ourselves into the little shade offered by the wall we leaned against. It was still daylight, an hour before the setting sun would indicate the start of the Sabbath, but the crowds were already assembling below. 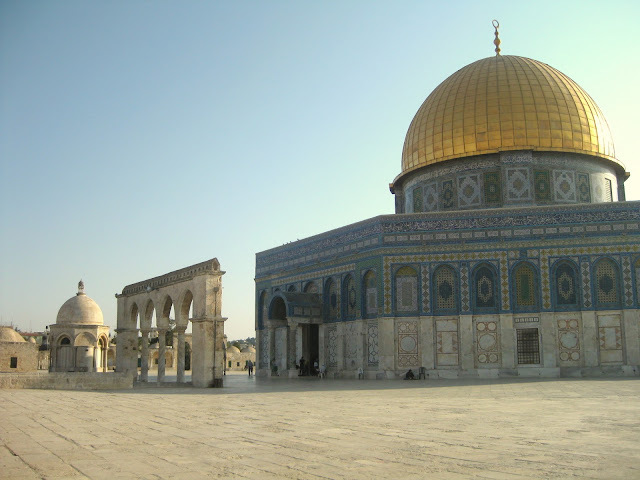 To our left, the golden dome of the Temple on the Mount shined with the last rays of the setting sun. We had only planned on staying in Jerusalem for three nights before heading to Tel Aviv. I’m not much of a city person, and the 100 degree August weather made us hesitant to stray too far from the beach (Or really, on that trip, any water). But on the night before our planned departure we had found ourselves reluctant to leave and made a last minute change of plans. 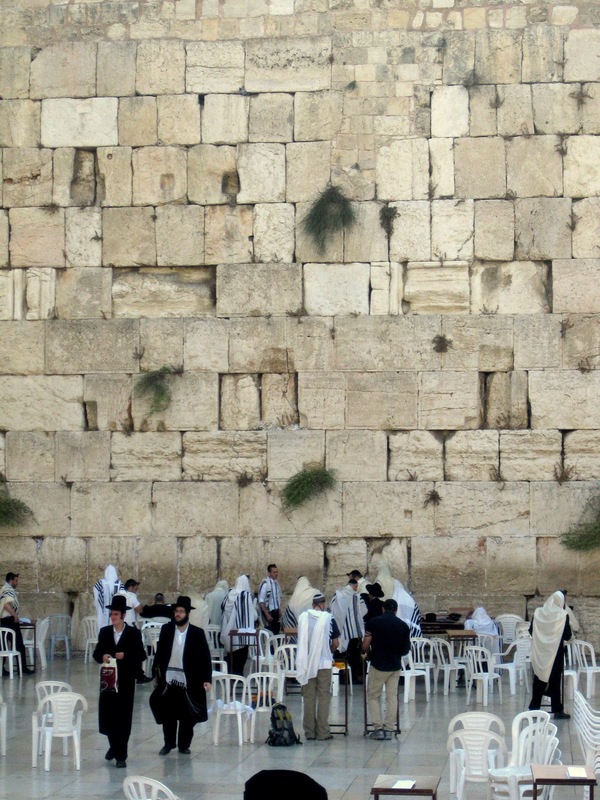 The next day was Friday, Shabbat, and we were in holiest city in Judaism. But Jerusalem isn’t just the holy city of the Jewish People – it is also claimed by the Muslims and the Catholics as their own. Our stay happened to coincide with the Muslim holy month of Ramadan and tomorrow’s sunset would not only mark the start of Shabbat, it would also put an end to the Muslim day of fasting. Jerusalem is one of the most hotly contested cities in the world, located in a country that rarely finds itself out of the news. We had spent days wandering through the city’s four sections (a fourth section is home to the city’s Armenian population) and we were eager to stay and witness the culmination of religious celebrations. After a few calls to sort out our hostel accommodations, we decided to extend our stay another night. We had started the afternoon with the Franciscan Monks as they celebrated the Catholic tradition of the walk of the Via Dolorosa – the stations of the cross. 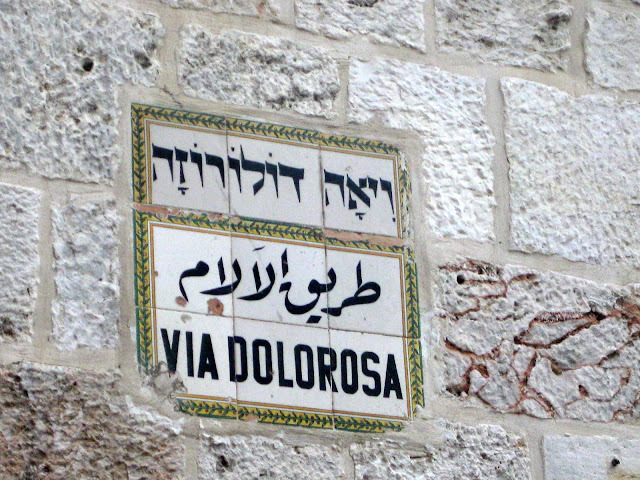 Joined by hundreds of other devouts and tourists we walked slowly through the walled streets visiting the sites of Jesus’s suffering and execution. 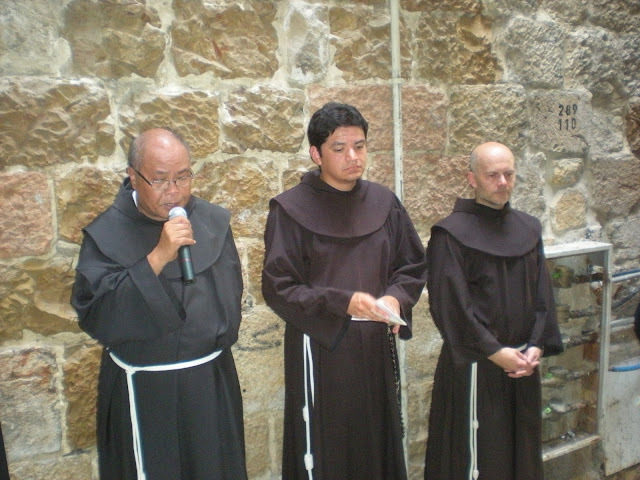 The service was led by four monks who read out the stations and associated prayers in four different languages – Hebrew, English, Spanish and Latin. We were literally melting with sweat by the time we got to the 9th station and were happy grab a cold beer and falafel. Because it was Ramadan and those of the Islamic faith were fasting, we were careful to always eat inside at either Christian or Jewish establishments. Now we found ourselves overlooking the pre-sabbath festivities and debating our next steps. From our current spot we had a great view of the festivities below – old men wearing Shtreimel (large round fur hats), little children in suits and yamekahs, and young soldiers in full uniform. While, the women entered the plaza and quietly proceeded to their small section of the wall, the men congregated in the Plaza – talking, dancing, and singing. Only the young female soldiers seemed to join their male counterparts in the revelry. Soon the urge to go down and join the crowds was too strong to resist and we headed down to the entrance. After making our way through the metal detector line, we headed out onto the plaza. Since we had visited the wall earlier the day and because we didn’t want to intrude on the celebration we stood with the other tourists off to the side of the plaza. Even without participating it was hard not to feel like part of the energy and excitement. Later that night, as we walked through that narrow streets back to our hostel night began to fall and we passed the beginnings of the Ramadan celebration – the end of that day’s fasting. 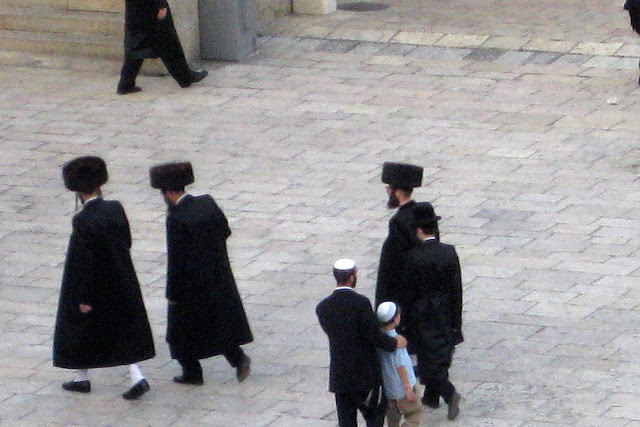 The streets were still crowded with nuns and monks as well as women and men dressed in traditional Jewish Orthodox dress. Despite the four days we had already spent in Jerusalem, these last few hours with the convergence of these three historic religions was what gave us a true view of what makes the city so unique. 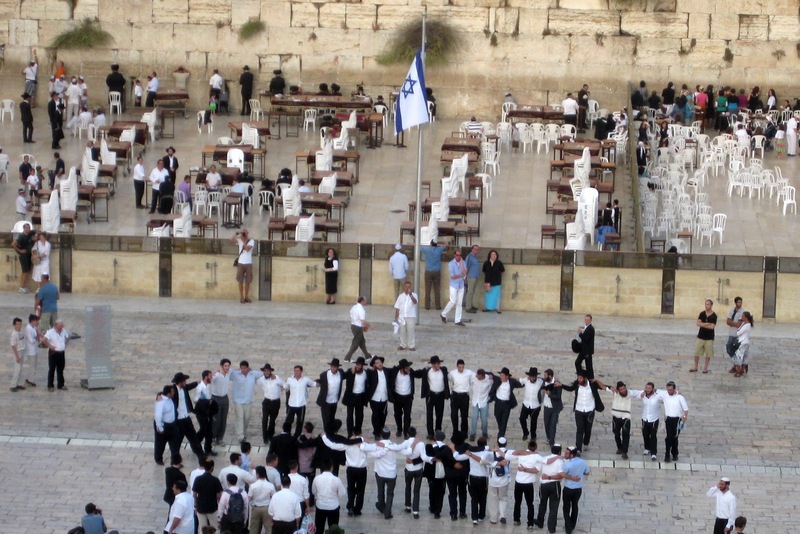 This entry was posted in Destinations and tagged Israel, Jerusalem. Bookmark the permalink. What an experience! I think I would tack on some extra days too just to see this converging of religions. I have always wanted to visit this part of the world. Thanks! Israel was an amazing trip. lovely story and photos — i feel like i went on a mini-vacation! thank you for sharing!